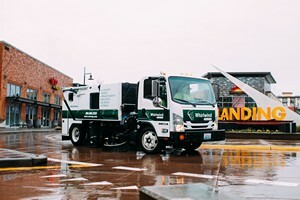 Whirlwind Clean & Green has performed site and maintenance duties at large retail centers from the beginning. We maintain properties for the largest property management companies in the world. Regardless of portfolio size or location we can create a program for your site's specific needs. Whirlwind Clean & Green is committed to providing the VIP service the client deserves. We train our employees to identify safety risk and liabilities; crews document and report issues to operations in real time. Our program allows Property Managers to have the onsite presence daily schedules rarely allow. 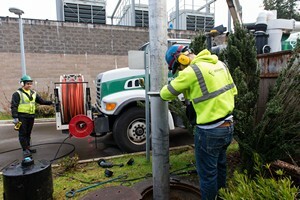 Crews are patrolling your location looking for sanitary issues or maintenance concerns on your behalf. Whirlwind creates a maintenance plan for your location that can increase your tenant occupancy and customers' satisfaction during their shopping experience. Whirlwind employees maintain a clean uniform that exceeds OSHA high visibility requirements. They are trained and equipped to handle various tasks that may arise while in the field. 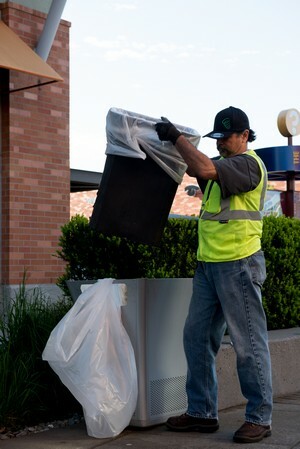 Whirlwind Clean & Green can manage all of your on-site needs with one easy phone call. Power lot sweeping is the EPA's #1 recommended best management practice to reduce the amount of pollutants entering local rivers, lakes, and streams. Trash, sediment, heavy metals, hydrocarbons, oil, and grease are all pollutants that frequent sweeping reduces. Power sweeping not only keeps your property eco-friendly, it ensures a clean and tidy appearance. Landscaping is not all a visitor to your site will notice. A lot full of trash, dirt, dust, and debris is unsightly. Regular parking lot cleaning keeps the site in top shape. Whirlwind employs best management practices, water conservation and electronic water management monitoring into our service. We only utilize environmentally safe supplements applied by licensed pesticides applicators. 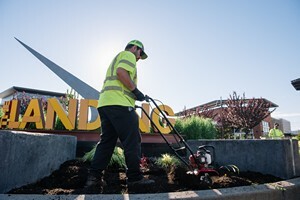 With our recurring landscape maintenance program in place, you can be confident that our experienced and capable team will work diligently to make sure that your property's landscaped areas are in the best shape possible, year round. Whirlwind's day porter service can quickly and efficiently handle day-to-day duties such as replacing light bulbs or cleaning spills, as well as help us to notify you of any issues, e.g. graffiti or large grease spills, that need special attention. Especially for larger properties, having someone regularly on-site is vital when there are emergencies that require immediate action. A very specialized service we have recently started performing may interest you if you own or maintain a "mega" site: a full-time day porter stationed on your property. The day porter performs the necessary daily custodial tasks and handles any emergent issues. The day porting service is a valuable building block in a commercial maintenance schedule, whether it bolsters sweeping services, maintains a clean property between sweeps, or acts as a part of a comprehensive service package alongside sweeping, landscaping, and special services. A spill on your property can be a terrifying thought. 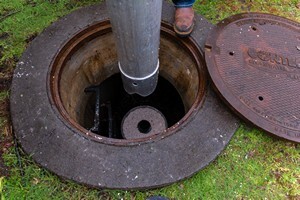 Whirlwind has trained technicians ready to responsibly clean up a spill at your site. Whirlwind performs spill response and remediation for unregulated materials in our service package. Our technicians are ready to contain, clean and responsibly dispose of the materials and provide a detailed report for your records. Let's be honest-spills happen, and when they do you can depend on Whirlwind Clean & Green to perform the proper corrective action in a quick and timely fashion. 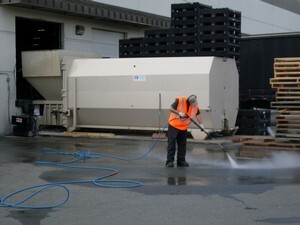 Our pressure washing crews are trained in the latest water reclamation practices. Whirlwind has several methods to responsibly capture waste water from your site's pressure washing service. Environmental pressure washing should be a normal practice, not an extra charge to keep the client safe from litigation. Our commitment to excellence goes above the industry standard. When rainfall occurs, some of the precipitation infiltrates the soil surface, some is absorbed by plants, and some evaporates into the atmosphere. The remainder, which runs off land surfaces and impervious areas, e.g. roads, parking lots, and roof tops, is what we refer to when speaking of stormwater. Whirlwind's stormwater team is dedicated to helping our clients understand the purpose and function of the stormwater system at each of their commercial, retail, and industrial sites. Each property, based on location and on-site activities, has different requirements and regulations regarding Best Management Practices (BMPs) they must follow. Lack of maintenance can lead to local flooding, water damage, and costly repairs in addition to corrective actions mandated by the city or other authority. It is our job at Whirlwind to help you keep every one of your properties in compliance with all local standards. 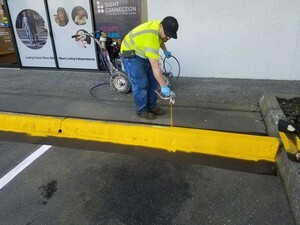 When you hire Whirlwind to seal coat and stripe your property's parking areas, you can rest assured only the most durable paint is used, which is applied with airless spraying equipment. Whirlwind can also create custom stencils to mark anything from "No Parking" zones to "Reserved Parking" spaces. We consult with our clients before the commencement of a striping and marking project to learn the best time to complete the work, thereby reducing customer and tenant inconvenience and reducing potential liability issues. Count on Whirlwind for all of your commercial striping needs. Our technicians have the tools and industry knowledge to keep your site in safe working condition and aesthetically pleasing by performing seal coating, lot striping and asphalt/concrete repairs routinely throughout the country. Whirlwind technicians also repair or replace speed bumps, curbing, and expansion joints. Whirlwind's technicians can also perform on-site welding if requested. Whirlwind has the unique ability to provide our maintenance clients with a comprehensive winter storm program that helps prevent the possibility of customers and tenants becoming injured during severe winter weather. Our maintenance crews closely monitor the exterior temperature and immediately address de-icing needs on common area sidewalks and parking areas to help eliminate possible slip-and-fall occurrences. Whirlwind's winter storm program helps keep your property up and running, even during the most inclement weather. We utilize environmentally friendly deicers that are certified (OMRI) safe for human consumption. The use of sand should be a last resort as it creates an extensive cleanup effort indoors and out. 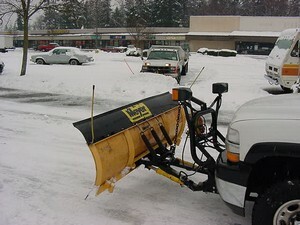 Whirlwind uses safety plows with breakaway technology to eliminate property damage and increase our clearing rates. Whirlwind offers clients dust management services to ensure you have healthy work conditions. We use environmentally safe surfactants to adhere to dust so it falls to the ground instead of into lakes, rivers, and other environmentally sensitive areas. When fugitive dust settles, it can accumulate on the floor or even inside equipment and electronics, causing unscheduled downtime to clean up the mess and maintain equipment. Preventative action is much easier and less time consuming than the cleanup after the fact. Dust control and prevention agents reduce the surface tension of water, so it absorbs more readily into the bulk material, making the particles more cohesive. These cohesive particles adhere more easily to each other creating larger and heavier particles. The heavier particles are not able to be entrained by the air movement that comes along with moving the material. Dust creation is reduced or eliminated. Binders and crusting agents in dust control prevention agents will act to prolong the effects of the dust control application through several transfers and onto stackout piles.